As I mentioned in my last post, this week I had some health issues that prevented me from blogging. Health issues that broke my heart – quite literally. As anyone who reads this blog would know, I've really been loving my new home. Yet I've also had some "humility" in endurance. At first I thought it was just that I needed to adjust to the altitude. But as I found out in the wee hours of Monday Morning, I was dealing with a lot more than that. Without getting into specifics, I'll say here that I am dealing with a serious heart issue that is exacerbated by the altitude. Unable to breathe and with a crushing pressure in my chest, I went to the ER at 2 a.m. Monday morning. (Six minute drive – gotta love that!) After a lot of test and meds, I went from the ER to ICU and then to a regular room. I checked out on Tuesday night but was re-admitted on Wednesday and returned home Thursday night. The net-net is that I have some meds and a procedure to go to determine whether I can continue to live here – or not. 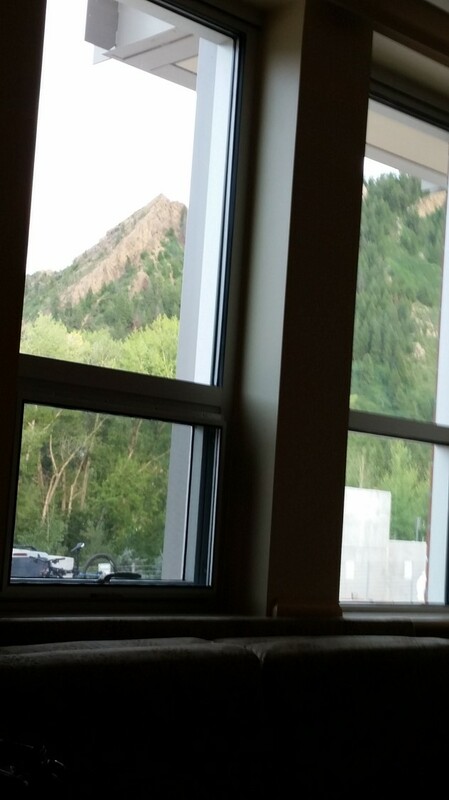 Even with that distressing news, my experience at Aspen Valley Hospital was exceptional. Truly top-notch care, friendly, professional and knowledgeable people every step of the way. Talk about Spoiled! I'd go so far as to say pampered! As someone who's not used to being waited on, it was a remarkable experience. Not to mention the views! So if you're reading this, please send good vibes my way to help me get through to the other side of this so I can stay.